Punctuation is the primary method of differentiating between various fragments of the text and make the reading process easier and more informative. Some punctuation marks are used intuitively, while others are often misused and need to be studied. 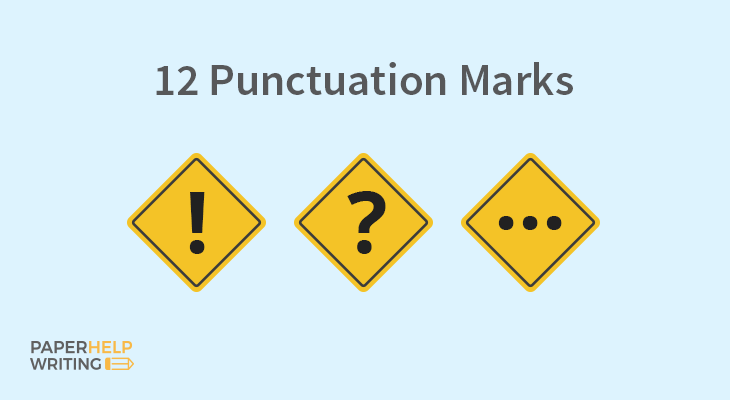 We have created a complete guide to teach you the basics of using 12 most common punctuation marks. The scientific definition of punctuation is a collection of symbols that can clarify the meaning behind the phrases and sentences, separate their different parts, and highlight the meaning of the words and word constructions. When used correctly, punctuation marks can enrich your writing and make it complete and legible. There are 12 most common punctuation marks used in the English language, and here are the tips on using each one of them. The full stop is among the most widely employed punctuation marks in English and is actually one of the marks that are employed intuitively. A full stop is not used to highlight the meaning or elevate the style of the text; its sole purpose is to signal the completion of the sentence. Each sentence that has a direct question at the end of it will also have a question following the last word, but it’s only true for direct questions. Sentences that include indirect questions do not require a question mark. Similarly, if a sentence is categorized as a request that is worded like a question, it does not need a question mark at the end. At the same time, long and complex questions, often found in periodicals, should always be followed by a question mark. If there is a question inside the sentence, for example, when it’s in quotes or parentheses, a question mark is always needed. The role of the exclamation mark is a stylistic one: it is a tool that is used for conveying emotions like excitement, as well as point to the urgency or dramatic character of the sentence. Using an exclamation mark when necessary is a sure-fire way to make your text more attention-grabbing. Less common instances where the exclamation mark is used include the expression of sarcasm or in cases where the exclamation mark is used together with the question mark to demonstrate surprise. Using multiple exclamation marks is not acceptable in literature and professional setting, but is perfectly normal in informal writing. Comma is one of the most diverse punctuation marks with several important purposes. The most common use of the comma is to separate different elements of the sentence like adjectives or items of a list. When there is a need to create a logical pause between two parts of the sentence, a comma should also be used. Another instance where the comma is widely used is when you’re writing down the date or want to separate the name of the city from the name of the country. There are several instances where a semicolon proves to be indispensable in a text. The first one is when you want to omit conjunction from a long sentence to improve its readability. Another reason to use a semicolon is when you have two related short sentences that you want to combine into a single phrase. One more acceptable use of the semicolon is to separate the items on a list. The colon punctuation mark usually precedes a list of items. When you are writing a sentence with two independent clauses, where the second clause illustrates the first one, also use a colon. Sometimes colons are used interchangeably with the em dash to signal the end of the sentence. The parentheses are usually used in of the two cases: when you need to introduce an afterthought into the sentence and when you need to provide clarification. In both cases, it’s very important that the sentence reads logical and informative, as well as makes sense, even without the text in the parentheses. In other words, the parentheses should not change the structure or sense of the sentence and should only provide additional information. Hyphen is most commonly used in compound words, or words that consist of two or more words that represent a separate idea. However, not all compound words are written with a hyphen; some of them can open or closed compound words. Another common case that calls for the use of hyphen is numbers written as words. It’s very important to differentiate between the hyphen and the en dash. The most common use of an en dash is a range of numbers, distance, or relationships. The first two instances are rather clear, but the third one is rather complex. The range of relationships that can be introduced by an en dash includes connection, conflict, and distance. The em dash is one of the most widespread punctuation marks in professional writing. Depending on the context, the em dash can be used instead of parenthesis, comma, or semicolon. The main purpose of the em dash is to make a stylistically grounded interruption in the text. To introduce a quote within a sentence. The only case where double quotation marks are used is to signal the presence of quotes. There are no other situations where the use of quotation marks is justified, whether it’s for emphasis or to highlight a title of a book or film.